It’s exciting times at Decorative Panels Components as we are currently installing the ultimate fully automated edgebanding line at our state-of-the-art factory in Elland. 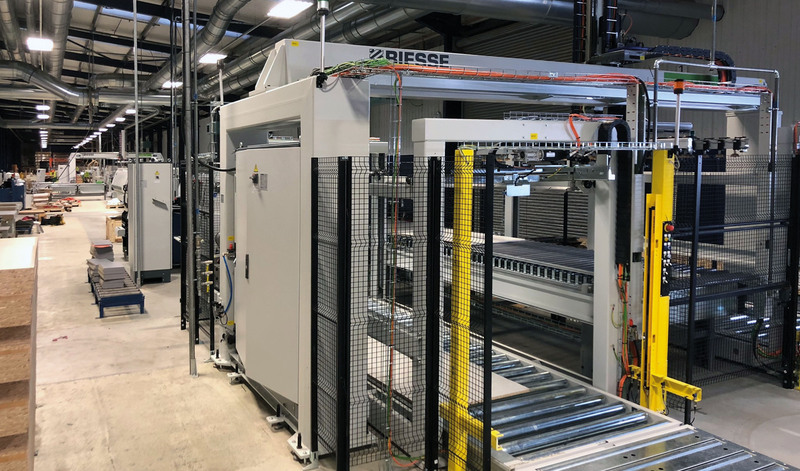 Purchased from Biesse and measuring a staggering 59 meters, this new line will focus primarily on high quality fascia production, processing tapes from 0.4mm to 2mm thick. increased while manual intervention is eliminated. 1. EVA Glue - EVA is the most common glue available and allows us to provide a suitable glueline for price sensitive product. 2. 2x PUR Glue - The use of PUR allows for absolute minimal visibility of a glueline. We have equipped the line to distribute PUR glue in two colours; either natural or white, subject to panel colour, to further minimise any sight of the glueline on the panel. Of course on lighter colours, white glue would be selected. 3. dp-seamless - To achieve the very best finish available on the market, Decorative Panels proudly introduce the new dp-seamless edgebanding standard. Our new line is fully equipped to process Rehau Raukantex Pro zero joint technology edgebanding tape, which cleverly creates the perfect invisible joint by means of a colour coordinated functional layer on the reverse. This layer acts as the bonding agent once heated with the Biesse Airforce technology. It is important to note that in order to obtain the best results, Decorative Panels recognise that it is not only essential to have the latest bonding technology, but also the very best specification of sizing, trimming and finishing systems installed. Every aspect of our new line has been specified with full NC control, allowing complete fine-tuning to ensure the finished tape profile glides seamlessly up to meet the panel fascia. All of this technology pulled together guarantees a truly spectacular finish that revolutionises the panel market. The additional advantage of course with NC control is automated setups between panel types, ensuring correct settings while greatly reducing downtime. In order to complement this new major investment, Decorative Panels Components also now have on order a new Biesse Single Sided edgebander. Recognising the need to match the same high quality levels for smaller panels, this machine has been specified with exactly the same systems and control as the main line. It will also process the two colours of PUR and Rehau Raukantex Pro edgebanding tape, ensuring that the full spectrum of panel sizes, including small drawer fronts edged on all sides, can match the new dp-seamless standard. In conjunction with the spectacular scope of dp-limitless surfaces available from our Lamination division, our new dp-seamless edgebanding system will ensure that our customers leapfrog the competition with the very best that both surface and processing technology has to offer. The dp-seamless standard will be available to the market from March 2018 and we are of course ready now to discuss your own specific requirements and future projects.